12 Cute Beds for Girls Ages 2 to 5 Years Old! 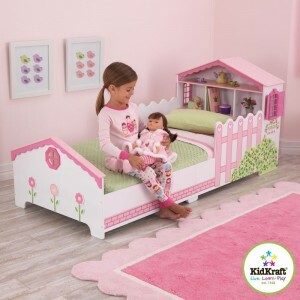 I Found the Cutest Beds for Little Girls Ages 2 to 5 Years Old! Are you looking for the best and the cutest bed for a very special little girl in the family? This is your final stop! I gathered here the most adorable beds for toddler girls and little girls ages 2 to about 5 or 6 years old! You will see many cute pink beds, of course, and also cute pink castle beds with slides, cute dollhouse beds, just like this one in the picture, and many others! Stick around and get ready for a dose of ‘cuteness’! *By the way, how adorable is this pink and white dollhouse toddler girl bed? Look at the cute flowers and pink fence with small hearts! Gorgeous Lalaloopsy Twin Bed for Girls! Cutest Beds for Toddler Girls! Look at what I have found here! The most adorable, fun and so very colorful and happy, Lalaloopsy twin bed for little girls up to 5 years old! I bet you are going ‘Awwwwww…’ right now! I think this is the perfect gift idea for a 3 or 4 year old little girl! 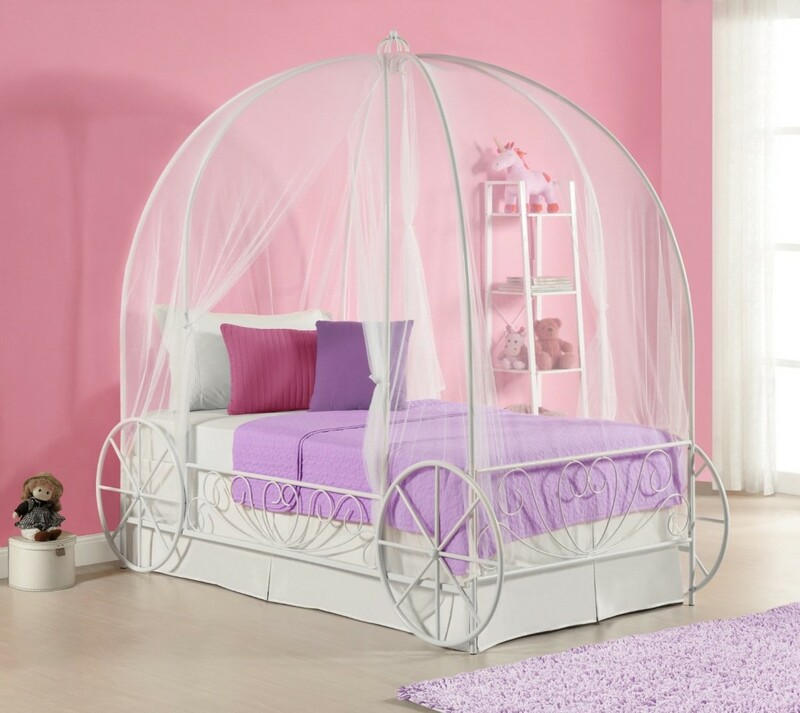 Amazing Carriage Bed for Girls! How cute is this white carriage shaped twin bed for little girls? Your little princess will be looking forward to bed time every night! She will have the most amazing ‘magical dreams’! I love the white metal finish! Step2 Pink Princess Palace Twin Bed for Little Girls! The Most Popular Best Beds for Girls! This gorgeous pink princess palace twin bed is one of the most bought pink beds for girls ages 3, 4 and 5 years old by parents! It is absolutely adorable and perfect to create a princess bedroom! The ‘scenic view’ on the window is magnificent! Very cute bed and perfect for story time too! Look at that little girl enjoying her new bed with a book! 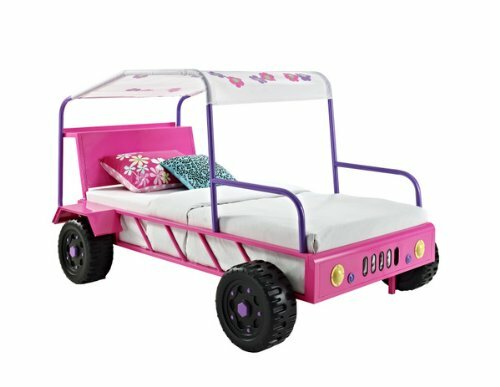 Gorgeous Pink Car Bed for Toddler Girls! If you are looking for a beautiful pink car bed for your little girl I believe your search is over! 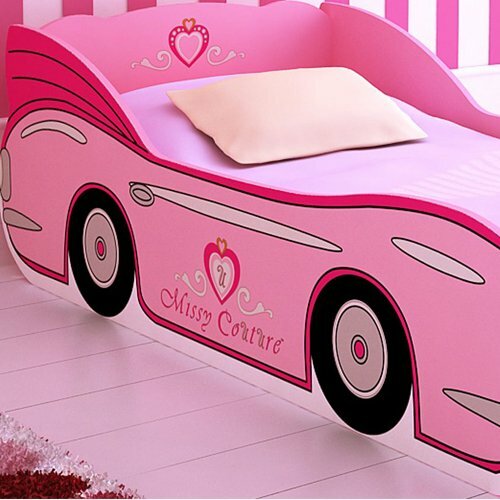 How stunning is this PINK car bed for girls ages 2 to about 5 years old? Can you imagine your little girl’s face when she steps in her bedroom and see her new pink car bed? If they made one for adults I would definitely get one for myself too! Stylish MISSY COUTURE PINK CONVERTIBLE CAR BED for Girls! How stylish is this pink convertible car shape bed for girls? Is that the most perfect bed to complement your little girl’s pink bedroom or what? It will fit little girls from ages 2 to about 7 years old! Lovely Light Pink Race Car Toddler Bed for Girls! Cutest Car Shaped Beds for Toddler Girls! It’s a cute and very light pink adorable race car shaped bed for toddler girls! It will fit girls up to 4 years old! Can’t think of a better way to have your little girl sleeping on her own ‘car’ bed than this! Awesome Twin Buggy Bed for a Girl’s Bedroom! How cool and unique is this pink buggy bed for a girl’s bedroom? It almost looks like it’s actually moving! Check out the floral canopy roof! 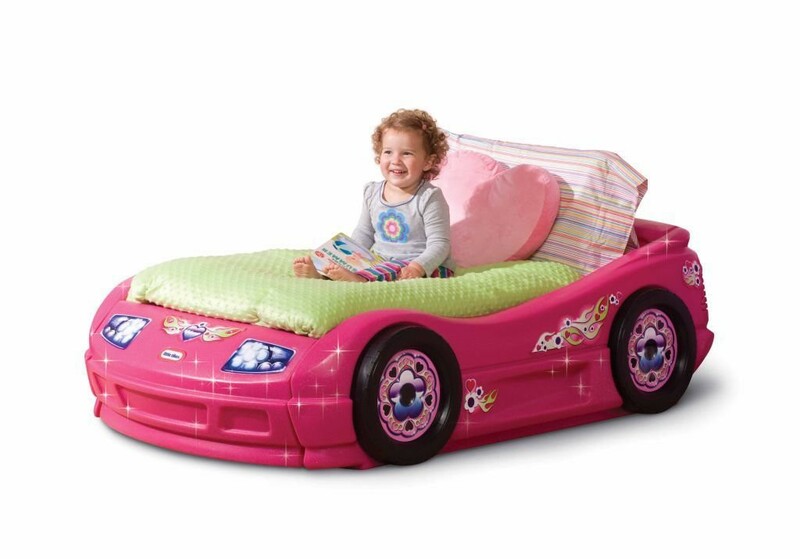 Definitely one of the most fun car bed for girls around! 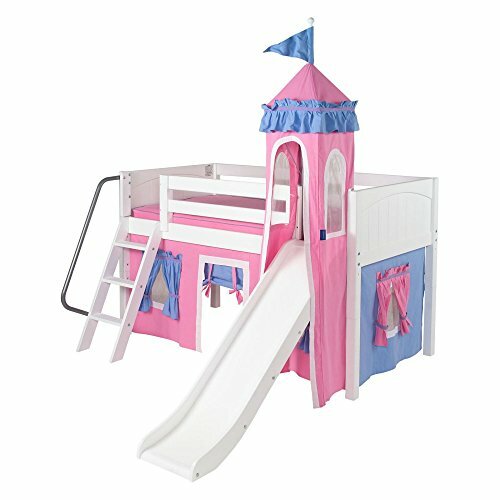 Princess Castle Twin Tent Bunk Bed with Slide for Girls! 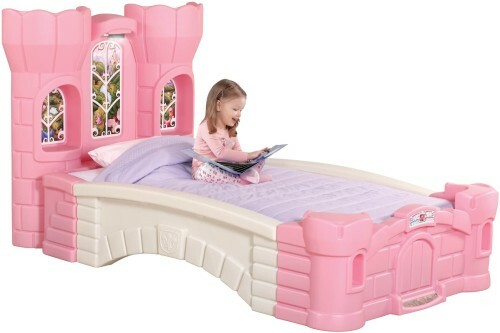 Best Castle Beds for Girls! 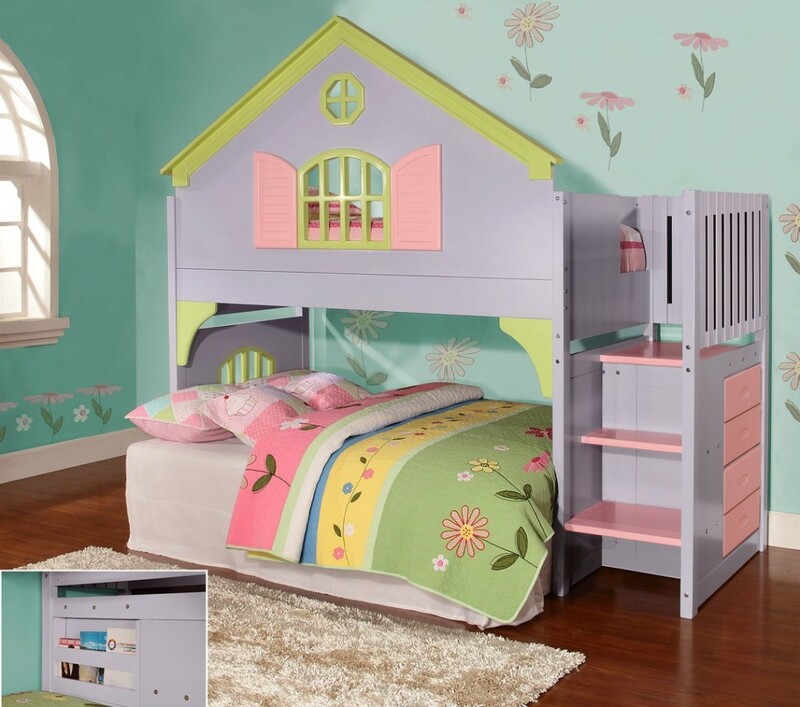 This is one of the best princess castle bunk beds with slide for girls! It is gorgeous, sturdy, spacious and FUN! As you can see it has a gorgeous ‘castle’ tent over the twin bed and a cool ‘hiding’ space below! Perfect for them play underneath with their dolls! The slide is the icing on the cake! Needless to say this is one of the most attractive beds for girls around! 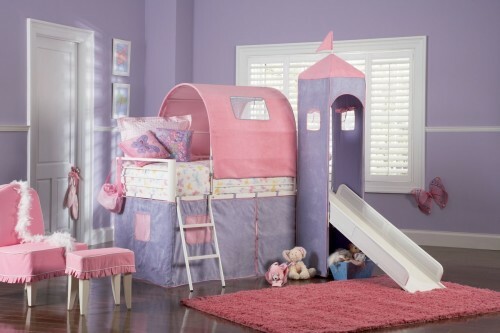 Another adorable and ultra-fun pink loft castle bed for girls with slide! It is perfect for a 3, 4 or 5 year old little girl’s bedroom! How adorable are the ‘flower shape windows’? ‘Sleep time’ has never been more fun! Why oh why can’t they make these for grown-ups too? 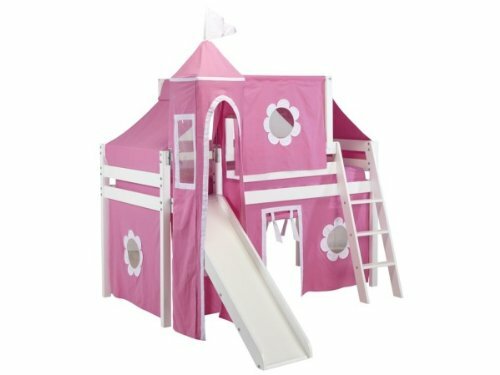 How adorable is this pink and white loft playbed with tent and slide for little girls? I love the cute windows design and the fun slide!! Your little girl will be in dreamland even before falling asleep! This loft bed is truly a dream! The Most Amazing Dollhouse Shaped Loft Bed for Girls Ever! And I definitely saved the best for last today! I present to you the best, the most amazing, the most unique, the most gorgeous dollhouse shaped loft bed with stairs for girls ever created! You will never ever have to persuade or bribe your kids to go to bed again! They will be looking forward to that moment every night! *I hope you enjoyed my selections of cute beds for girls from this page and were able to select the most adorable bed for your little girl here today! But if you still need to browse more, here they are! Fun and Unique Toddler Beds!